For several years the December installment of this photo collection has tried to feature winter scenes with Boston Whaler boats in them. This season I am about out of such photographs, but I do have a few from Jim Potdevin's Alaskan neighborhood that are quite unique. Following them are several collections of Rendezvous pictures from events held around the country and coordinated via the website. "I bought this Squall this past weekend for $50. No sail rigging, but the lady will throw in the oarlocks, if she can find them. Didn't take it home as its still frozen to the ground. Looks like a "project" boat to me! Couple of holes, some gel coat. It's been sitting on its transom for the last 15 years and been a mailbox for the last 20 years! 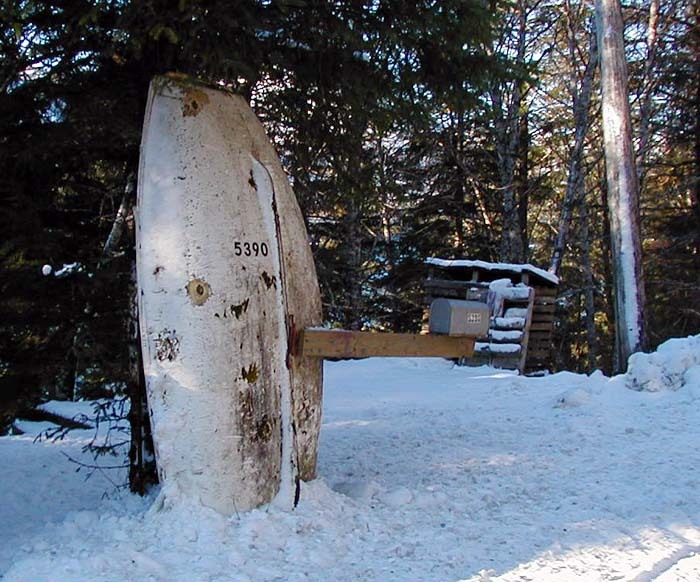 No idea of the hull number, still under ice, snow and frozen mud. I'll pick it up during the Spring thaw. "My wife was really thrilled!" The same day he bought the boat another fellow came by with an offer of $100. 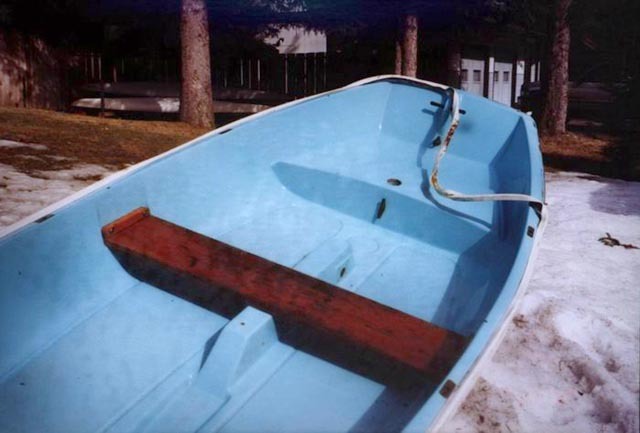 Jim has since cleaned up the boat, sanded the entire hull, refinished the mahogany components with ten coats of varnish, and begun the drying out process to remove extra water from the hull. The pictures below really tell the story the best. In general we have ignored the sailboat models from Boston Whaler, but this unique application warrants inclusion in our collection. 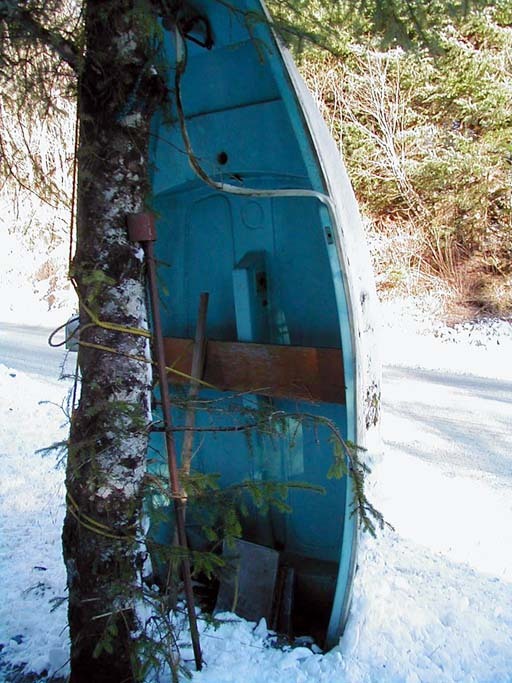 It looks like some of the running rigging from the sailing rig came in handy in mounting the boat to the tree. Jim may have a winter-long project on this hands with this boat. I bet it still floats, however, even if the hull weighs 484 pounds, a little over its original weight of 125 pounds. 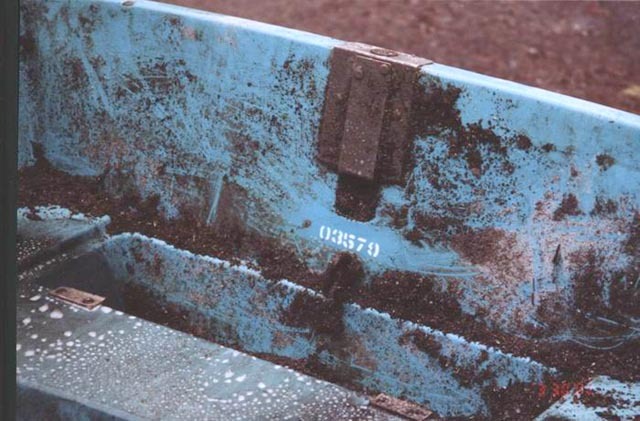 Under about 15-years of dirt, the stenciled Hull ID number was still clearly visible. 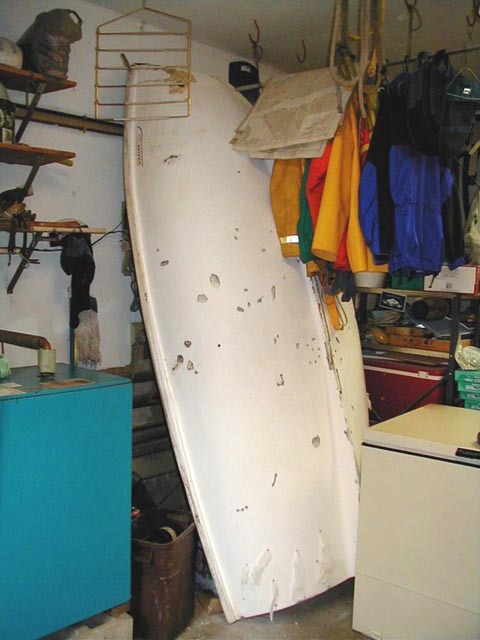 Chuck Bennett of the factory looked this one up: 1968 Rowing Squall built in Rockland, Mass. and shipped to a "Service Center" in Alaska in April of 1968. After soap and water cleaning, the hull began to show signs of life. The Whaler gel coat is quite durable and has held up to decades of abuse. The white rub rail is intact and just needs to be stretched back into position and glued. 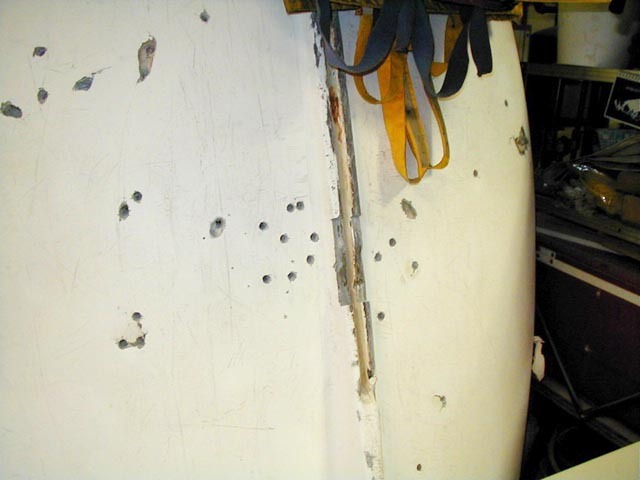 About 100 half-inch holes were drilled in the hull bottom to encourage entrapped water to drain from the various cracks and other damaged areas. Tilted up on its transom in the garage for many months, the hull began to slowly drain moisture. At last weigh-in it was down to 440 pounds. It is strategically located between the furnace and the hot water heater, and above the base board pipes. To help wick away water, the lowest holes are stuffed with paper towels to help draw out the water. Dryness is periodically checked by inserting metal shims into the foam. The shims come out either real wet, wet, almost dry, or dry, providing an index of interior mosture content. This project may take a couple of years to reach its original weight again. April 2002 = 484 lbs. August 2002 = 440 lbs. April 2003 = 400 lbs. April 2004 = 325 lbs. April 2005 = 325 lbs. May 2006   = 304 lbs. Halfway there! Only 180-lbs to go. That is a loss of 180 pounds in four years. Fresh water weighs about 62 pounds per cubic foot, so this implies that there were about three cubic feet of water entrapped in the hull which has now been removed. 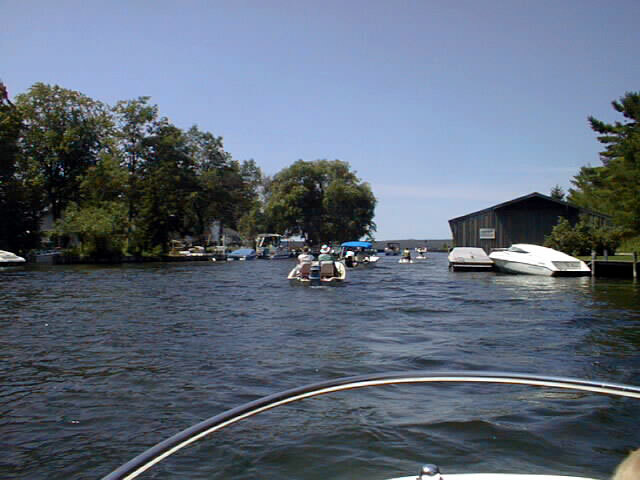 Enough of this wintry weather scenery, let's re-live some of those glorious summer days of boating in our Whalers. 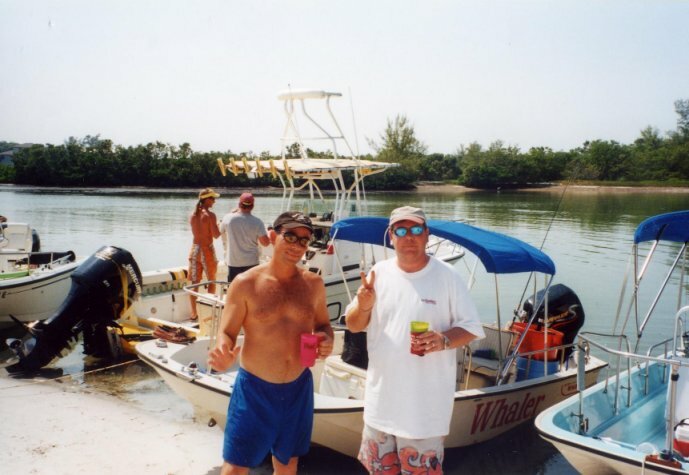 Here is a review of several Boston Whaler Rendezvous events from 2002. In 2002 there were many rendezvous events for Boston Whalers, classic or otherwise, which were organized and coordinated via the website. Several of these events have already been chronicled in CETACEA pages (Cetacea Page 62 and Cetacea Page 64), but before we turn the calendar over for a new year, here is a look back at some of the other gatherings held this past summer and fall. 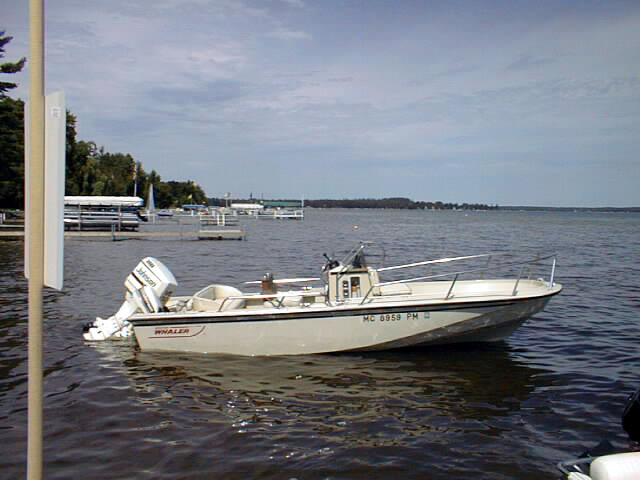 I don't think there are any mullet in Mullet Lakes these days, but this large lake in the northern tip of Michigan's lower peninsula is a wonderful place to go boating in a Boston Whaler. The lake is about 20-miles long and several miles wide. The southern end of the lake is fed by the Indian River, and the northern end flows into the Cheboygan River, which then runs about ten miles north into Lake Huron. 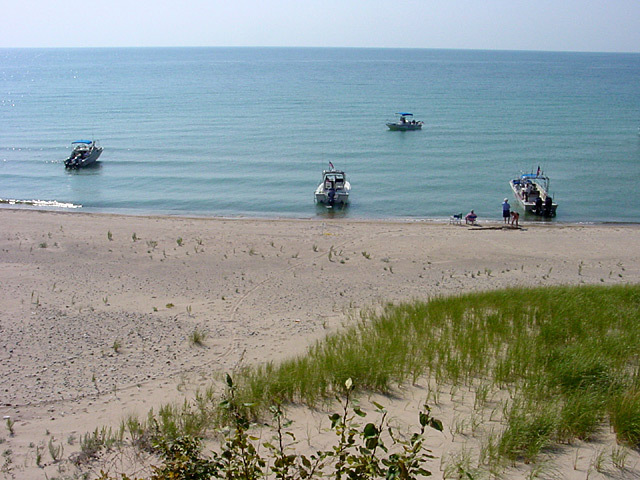 Following the Inland Waterway you can cruise about 70-miles upstream from Lake Huron, almost crossing the whole upper part of Michigan's peninsula to Lake Michigan, and visiting Burt Lake and Crooked Lake in the process. 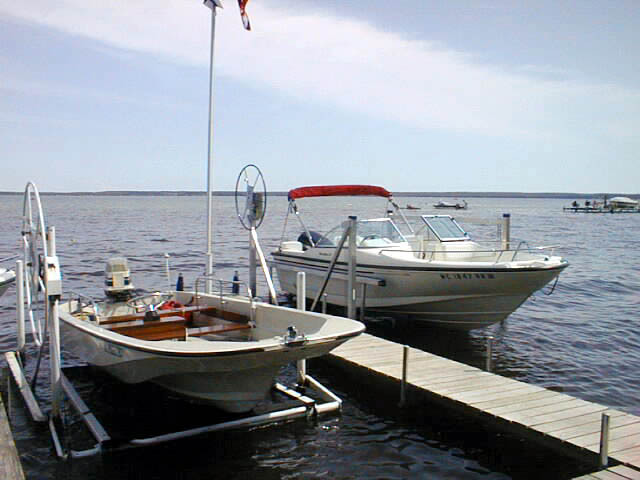 Tom Greenberg and Don Jahncke organized a summer rendezvous on Mullet Lake, using Don's cottage on the western shore as a rallying point. I could not attend this event this year, but I hope this becomes an annual affair, as it looks like a great place to get together and compare Whalers. Some of the rendezvous we've promoted in the past have been held in more remote locations, on bigger bodies of water, and required bigger boats to access, but this one was designed for the smaller boats from the start. A nice collection of Boston Whalers, new and old, turned out to enjoy the cruising. Tom Greenberg was the photographer that sunny August afternoon. 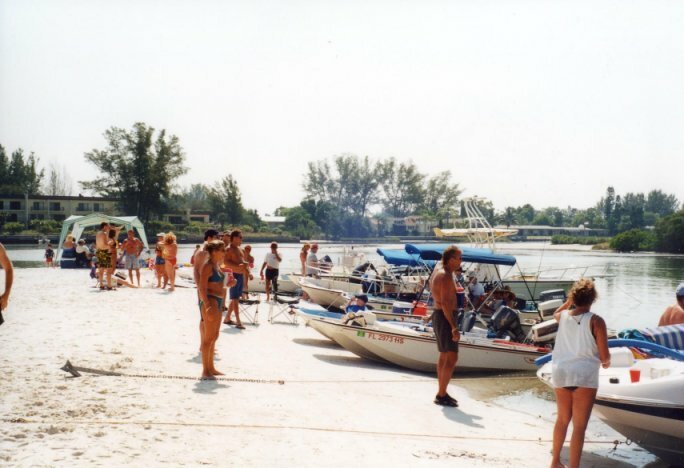 The Mullet Lake Rendezvous began at Don Jahncke's shorefront cottage on the northwest side of the lake. Don's 15-Sport appears to be in perfect condition. The 17-Dauntless is kept in similar fashion. Keeping the boats on lifts is very common in northern fresh water lakes. This kind of storage combined with the short boating season at this lattitude makes for very long-lived Boston Whaler hulls. This classic 19-Outrage was the queen of the fleet that day. If you walked into a Whaler dealer tomorrow and saw one of these on the showroom floor, could you resist the urge to buy it? This one has the optional wrap-around rear seat. The wide notched transom holds twin Johnson outboards. Either Joe's boat is aground or he is using invisible achor rode! 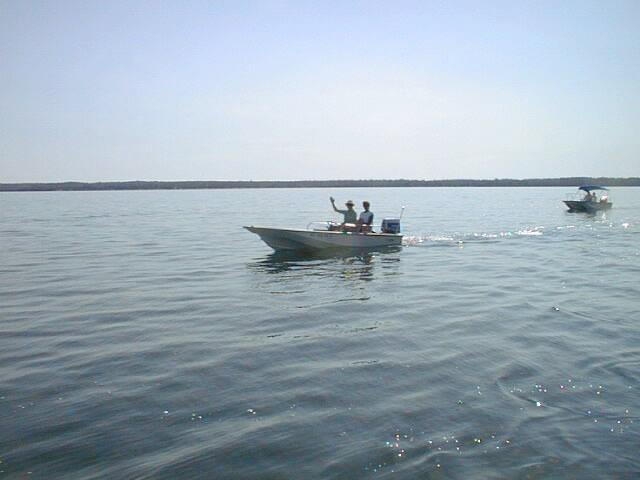 The lake was obligingly calm that day; Joe and Kathy Price aboard their 15-Sport are heading south toward Indian River. The slightly exaggerated flair of the bow, the low freeboard, and the sheer line sloping aft all identify this 15-foot classic. No, this is not the Atlantic Intracoastal Waterway, it's the Inland Waterway of northern Michigan. 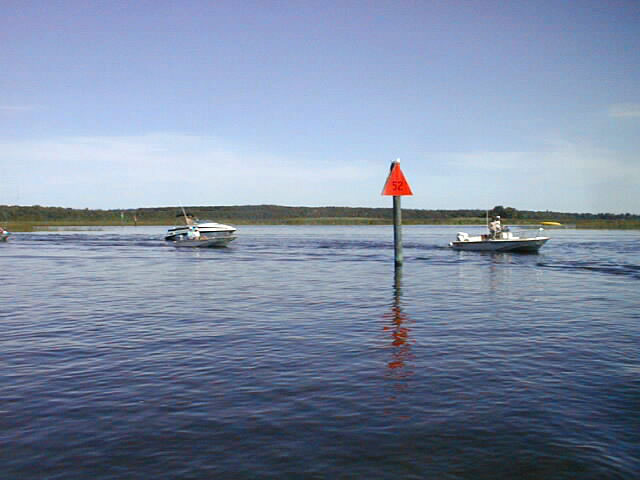 A navigable channel meanders across the southern end of Mullet Lake through a broad marshland. 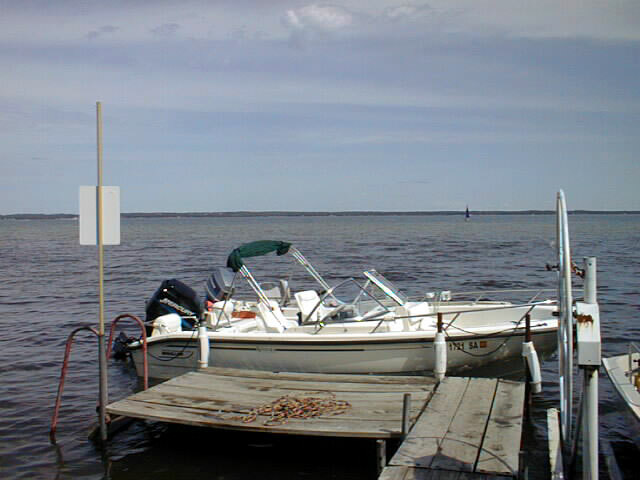 The inland waterway winds southward through the town of Indian River, and thence into Burt Lake. Our Whaler flotilla cruises along and enjoys the sights. The flotilla cruised past this fine example of classic Whaler, Spartan1's 18-Outrage moored on the sea wall in front of his cottage. Sightings of other Whalers were common on the trip. 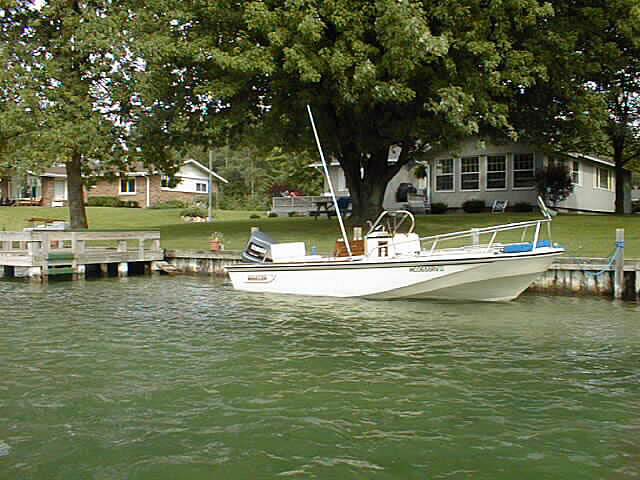 This beautiful 25-Outrage Cuddy with Whaler Drive and twin outboards was moored along the Indian River. I have always said that Tee-Tops are not popular in northern waters, but this boat gives the lie to that point of view. However, the lack of Michigan registration numbers on this hull makes me think it might just be visiting for the summer. Tom snapped this view of his 16-Ventura, and since he's the official photographer of this event, we can't omit it from the collection. Prolific poster Nick Manukas has been the main organizer of several gatherings in southwest Florida, the most recent held in October and known as "Boatoberfest." 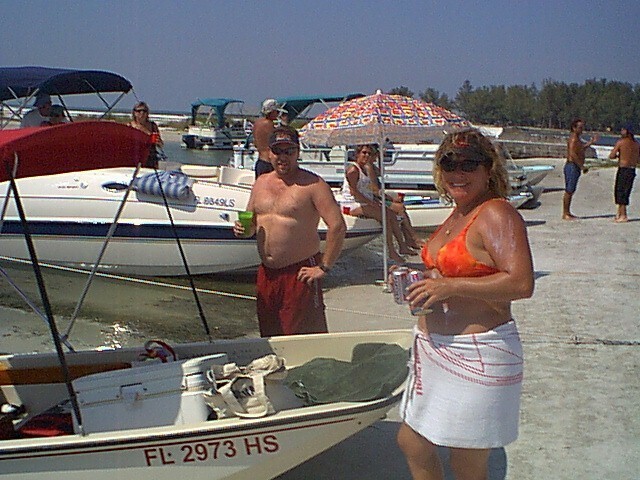 While the rest of us were winterizing our outboards and carrying gear off the boat and into the basement, these Floridian Boston Whaler owners were having a good time boating and socializing on a local island. Janis (AKA draftsmanswife) brought her mint 1973 13-Sport with 40-HP Johnson all the way from Daytona. Here she explains to another Whaler 13- owner (who just happened to be launching at the local ramp) what the gathering of classic Whalers is all about. This spot is known locally as "Beer Can Beach". 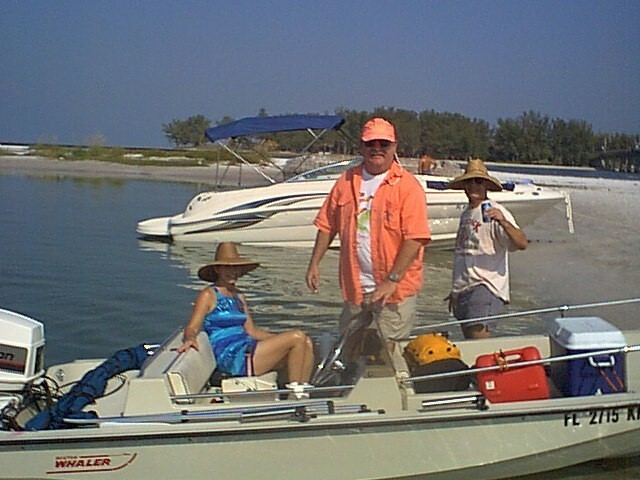 It is on Longboat Pass Inlet. 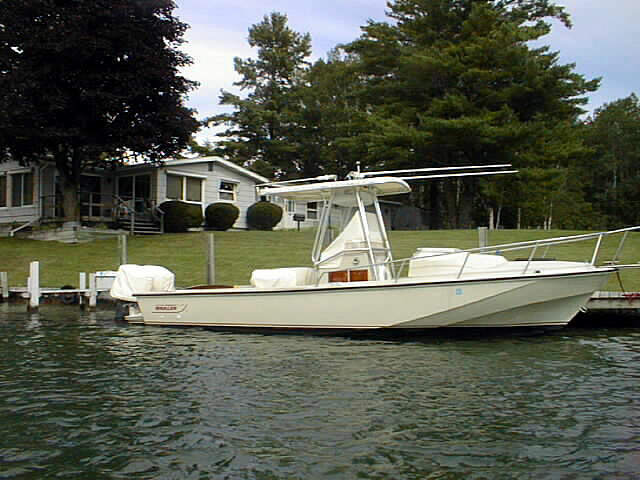 That's Nick's 1989 17-Montauk with 70-HP Evinrude nee Suzuki 4-stroke on the transom. 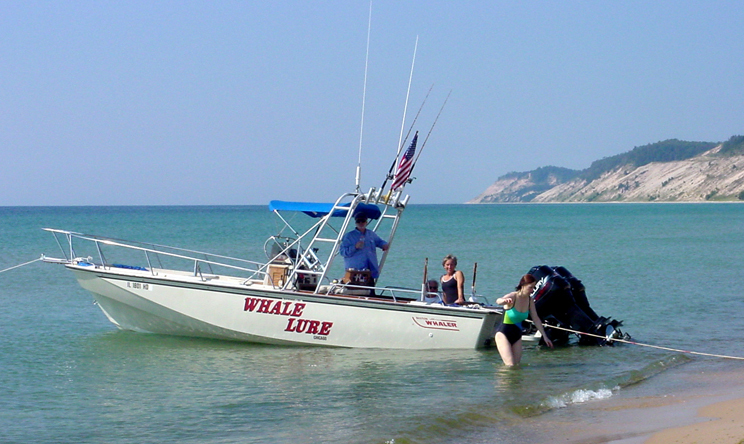 A classic Whaler appears to be an irresistable attraction to women in bathing suits. At least half a dozen Whalers had arrived by about an hour into the party. This is the view looking south along the beach. Nick (right) and Pat (Swellmonster) talking Whalers. A gaggle of scantily clad women block our view of several nice Boston Whalers. Women outnumber the men two-to-one in this rendezvous. Nick holds a nice plaque he just received from Janis and the others in appreciation for his efforts at organizing the multiple rendezvous events. To the right are Eric and his bride, who won a Whaler Banner for arriving in the oldest boat, a 1962 16-Nauset. 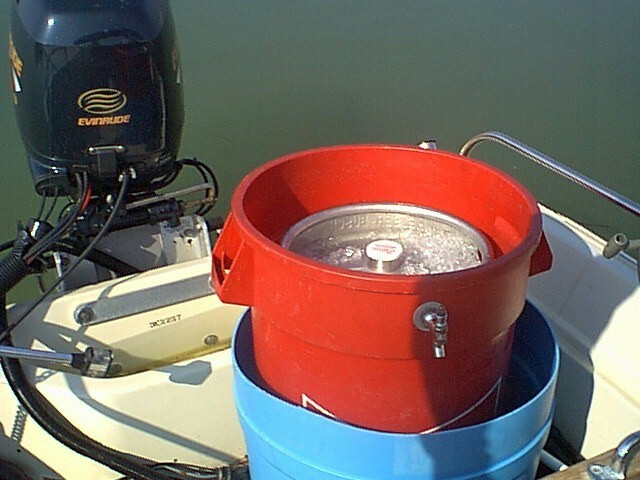 The fuel to keep the party going was carefully transported and cooled in this double-insulated open air cooler. On the transom of Nick's 1989 Montauk we get a glimpse of the Suzuki turned Evinrude 70-HP 4-stroke mounted on a jack plate. Bill C and friends with his very MINT 15-Super Sport Limited. They came down from St. Petersburg and across Tampa Bay. Our group of Whaler friends in the Great Lakes area held a last-minute ad-hoc rendezvous in Charlevoix over Labor Day. It turned out that this was one of only two chances I had to use my boat all summer, so the 300-mile trip up north and out into Lake Michigan was especially enjoyable. The weather was great and the winds were light, making the 60-mile round trip out to South Fox Island and back a comfortable ride on plane all the way. After cruising around it last summer, we finally made it ashore on South Fox Island for a beach picnic. Wisconsin is about fifty miles west over the horizon, Michigan about thirty miles east. You can pretty much count on having the place to yourself if you can get out here. From a rise on the dunes CONTINUOUSWAVE, BACKLASH, and WHALE LURE are seen here, with MEMORY further offshore. OUTRE is just out of frame on the left. My wife Christine steps ashore, gingerly crossing a pebble stone bottom, while I hide under the shade of a Mills Flying Top. Larry Goltz and Susan work on preparing lunch. The western dune shoreline makes a delightful background. The page has been accessed 78990 times. This article first appeared December 16, 2002.